Dr. Aiello, top left, talks about his research during on open house. 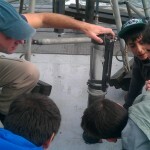 Dr. Ivano Aiello works with students on reviewing a sediment sample. 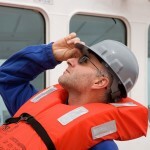 Ivano Aiello, a sedimentologist, reacts to the rather loud ship’s horn that is sounded during weekly life boat drills. Dr. Ivano Aiello’s interest in marine sedimentology started for him not on the shores of his native Italy, but in the mountains and hills of Tuscany. As an undergraduate student at the University of Florence, he learned that the soil in the mountains and hills was once part of the ocean floor. Aiello, a professor of geological oceanography with the College of Science Moss Landing Marine Laboratories, will share his research on microfossil-rich marine sediments and the information it provides about past climate conditions as part of the Spring 2016 University Scholars Series on March 23, from noon to 1 p.m., in MLK 225/229. “I want to share that same fascination I had and still have about the fact that many of the mountain chains that surround us are ancient, uplifted seafloors often made up of tiny fossils of critters, mainly marine plankton, that existed in now extinct oceans,” he said, noting that the occurrence of plankton can help in understanding past and future climate. Aiello completed a master’s in geology, then enrolled in a doctorate program at the University of Bologna, when the opportunity arose for him to travel to California to work with a professor at the University of California, Santa Cruz. Aiello decided to stay in California to complete his doctorate at UCSC and to conduct post doctorate research. He was invited to serve as a shipboard marine sedimentologist with an expedition of the International Ocean Discovery Program in 2011. “This experience was yet another turning point in my career that extended my research to the field of oceanography, prompted me to obtain grants and write papers that eventually allowed me to obtain a position as a faculty (member) at Moss Landing Marine Laboratories at SJSU,” he said. Aiello received the SJSU Early Career Investigator Award in 2011 and said he has applied for external funding to purchase much of the equipment his students use in his classes. He has received grants from the National Science Foundation, the American Chemical Society, the CSU’s Council on Ocean Affairs Science and Technology, and on-campus RSCA funds. He will be continuing his research as a shipboard sedimentologist on the Western Pacific Warm Pool International Ocean Discovery Program Expedition 363 next fall on a journey that will take scientists from Singapore to Guam. He is researching the possibility of teaching some courses remotely using telepresence. The University Scholars Series is co-sponsored by the Office of the Provost, the University Library and the Spartan Bookstore. Read more about the University Scholars Series online.